Looking for a USED B0385C? Compact machine corresponding to φ38 bar. ●Space saving machine assuring the wide machining range till φ38 bar. ●Hydraulic cylinder equipped on main spindle chucking unit ensures the stable clamping. Applicable for off-center machining with an attachment. ●Wide tooling zone. Easy set up and better chip disposal. ●The automatic programming system prepared as a standard accessory minimizes tool change time and generates the optimized tool path. 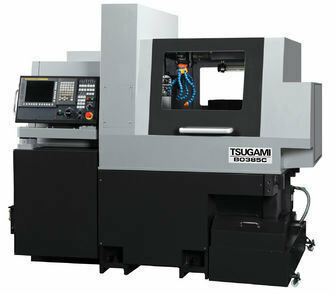 Looking to Purchase a New TSUGAMI B0385C?